A Shrouding Circle is an opportunity to practice caring for a body in a sacred manner. It also offers the one who is playing the role of the deceased person to experience what it would be like to be cared for in this way. 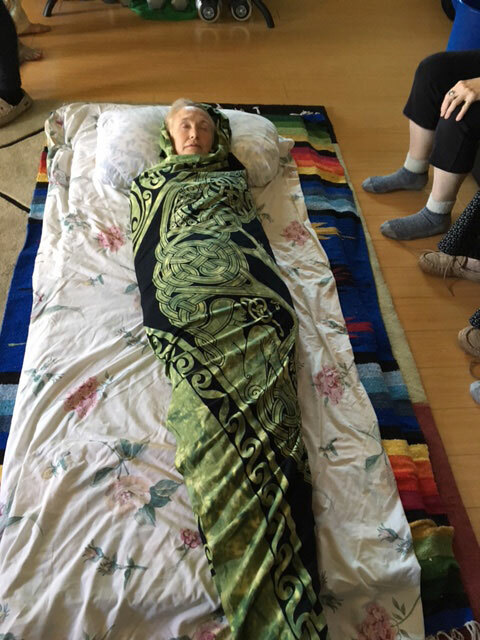 Let these photos and the words of, Annelise Schinzinger, our “Decedent” reveal how a “demonstration” of moving, washing, dressing and shrouding a body can be turned into a profound experience. I felt very supported by the eight women who lifted and carried me from the bed to a mat on the floor, where they bathed my arms, hands, face and feet with a washcloth and warm water, and with great tenderness prepared my body. 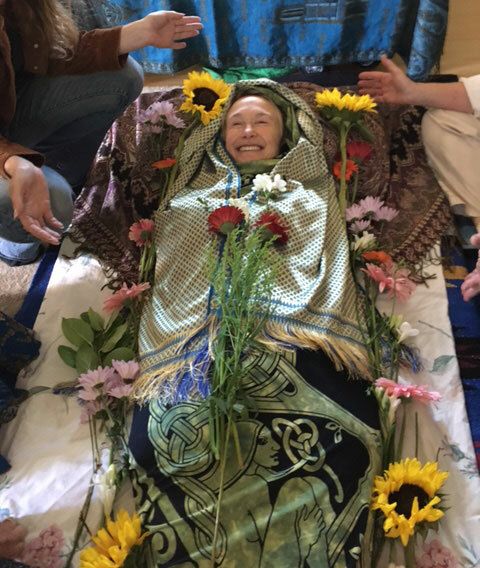 Every time they changed my position to clothe me in burial garments and wrap my body in a death shroud, I felt gentleness and care in their coordinated effort. 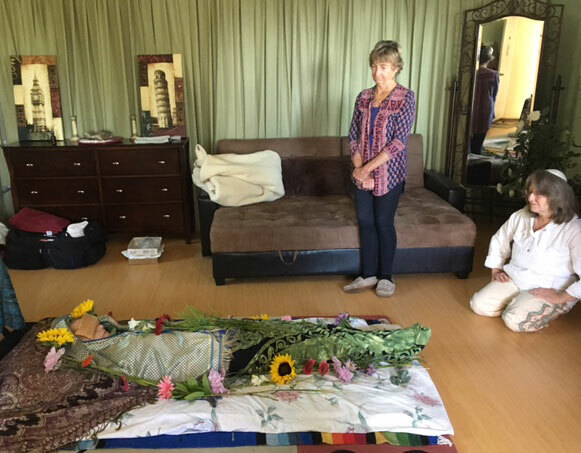 I enjoyed hearing Holly play the flute and sing, and the purification prayer/blessing energy clearing icaro that Naomi sang was very effective, as was the smudging and words of appreciation spoken by others about me. It was the first time that I was smudged with the addition of brushing my arms and legs. The energy clearing felt more thorough this way. I fell asleep when the first flowers were being laid on me. Afterwards I was surprised how dead I looked in the photos and was very happy to see the smiling photo at the end. The experience marked a pivotal moment in my life and I am deeply grateful for the experience. Much Gratitude to Holly and Naomi, and to the circle of women who made this a very special and memorable day. Convening a Shrouding Circle has the potential to grow into a precious bonding experience. Imagine a small group making a commitment to “be there” for one another, having learned the ancient art of caring for our own dead. Contact us to find out how to start a Shrouding Circle in your community. Naomi Rose is an officiant, celebrant and ceremonialist. Thanks for taking the photos, Naomi!